The Mexican food also has its exotic side because even the flowers are served on the table, forming part of some delicious dishes. This is the living proof that the Mexican cuisine is vast and very creative. – We know that it sounds weird to eat flowers, but don’t worry as the squash blossoms are perfectly edible and very tasty . In fact they form part of the traditional Mexican cuisine and they are also very present in the Italian cuisine. In this recipe first a filling of squash blossom with epazote and onion is cooked. Then the filling is put on maize tortillas together with cheese. This combination gives as a result, the quesadillas with the most natural, fresh and delicate flavor that you have tasted . 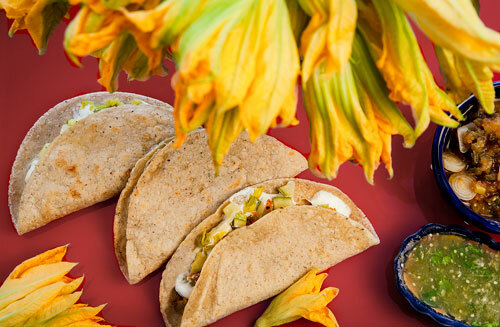 The squash blossom quesadillas can be enjoyed as breakfast , you can also serve them as appetizer or you can prepare a divine dish of squash blossom quesadillas with nopal cactus salad and refried beans. A real beauty! Making this recipe is very entertaining and simple. First the squash blossom has to be prepared, then it is fried and at the end the quesadillas are made. You will like the process. It is ideal to use fresh squash blossoms however if you don’t get them you could use canned squash blossom. Just drain the liquid in which they are prepared and follow the same preparation process. Don’t store the squash blossom in the refrigerator for more than 1 day because they dry. To make the quesadillas you will need a cheese that melts. We recommend the Oaxaca cheese, the Chihuahua cheese, the Manchego cheese, etc. Preparation time 15 minutes . Cut into strips 5.2 oz of cheese that melts, then reserve. Finely chop 1/4 of an onion and 1 epazote sprig; then set aside. Wash 1 squash blossom bunch. Remove from each squash blossom the stalk, the pistil and the calyx peaks. Upon completion discard the stalks, pistils and calyxes. Cut into small chunks the squash blossoms with the ones you worked, then reserve. Heat in a frying pan over medium heat 1/2 tablespoon of olive oil. The small Squash Blossom chunks that were chopped. The Epazote that was chopped. Mix the frying pan ingredients and fry them for about 4 minutes, until the squash blossoms are well fried and the water that they release has totally consumed; stir regularly. Then set aside. Heat on a griddle over medium heat 6 corn tortillas for about 20 seconds per each side, until they are soft. Some of the Cheese strips that were cut. Some of the Filling that was cooked. Heat the squash blossom quesadillas for approximately 1½ minutes per each side, until the cheese has melted. While the squash blossom quesadillas are heated press them gently so the filling units and the cheese will melt better. Tip: Although these quesadillas are stuffed you can also put them a delicious green salsa. Recommendation: Put the quesadillas in a tortilla container so they remain soft and warm for a longer time. Variation: Now taste the mushrooms quesadilla. Did you like the Blossom Quesadillas? ᑀ History of the Mexican Food. If you have problems getting the squash blossom, don’t worry any more... It is here! If you also have problems finding the epazote, don’t search anymore... It is also here! Cook with style with the “Woll Nowo Titanium Skillet". The titanium makes the skillet more resistant, nothing sticks to it, it is easy to wash... is a true wonder, you will like it.